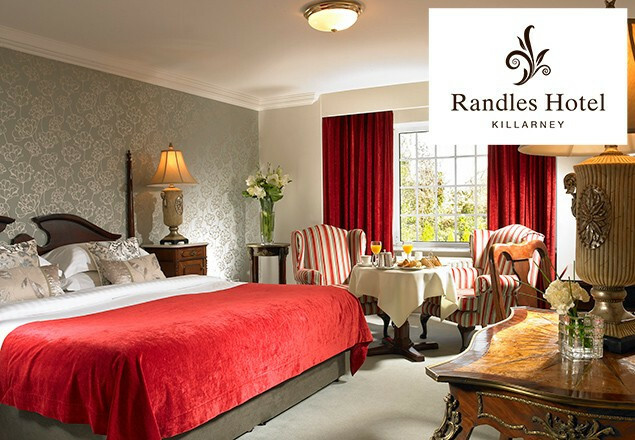 Rewarding Times have teamed up with the luxurious Randles Hotel in Killarney, to offer you 2 or 3 night break with Afternoon Tea, Prosecco, Butlers Chocolates, Late Checkout & €40.00 Off Spa Vouchers. Enjoy 2 nights at the weekend or a 3 night midweek stay in a luxury bedroom with Butlers Chocolates & Prosecco in your room on arrival. Enjoy our famous traditional Afternoon Tea by the fire in The Drawing Room featuring the exclusive Prince & Co. Teas from London. You will also be treated to a cooked to order Irish Breakfast served to your table each morning. Also on offer is a €20.00 Spa Voucher per person and a 5%-10% Food Discount in Kayne’s Bar & Bistro. To finish off your stay you can also avail of a late checkout at 2pm on the day of your departure. Late checkout on your morning of departure. Offers are available until March 1st 2018 excluding Bank Holidays and Holiday periods. 2 Spa vouchers of €20.00 per person. Vouchers are valid per treatment on all treatments over €45.00 and are not valid in conjunction with any other offers. Spa Treatments must be booked prior to arrival as availability cannot be guaranteed.